A few days ago I began a new knitting project, since I had finished the sweater. “Wait!” you say. “You finished and you didn’t tell us?” Well, it’s not finished-finished until it’s blocked, and I’d rather not model it while it’s soaking wet, thank you very much. And pictures of it laying flat on a table get old after awhile. Ahem. As I was saying. I began knitting my first shawl. The Emily Dickinson shawl, it is called, and it’s available for download on Ravelry. (I’m LoveFiber on there, by the way.) This is my first shawl, my first knitted cobweb lace-weight, and my first time adding beads to a knitted project. And let me just say it now, knitters have things so easy where beads are concerned! You just pull the loop up through the beads one at a time with no fuss. The last beaded non-knitting project I made required loading the seed beads onto the yarn ahead of time. All hundred and something of them. Then I had to keep scooching them along the yarn until I needed one. Crazy. I’m rather pleased with myself for only having to cast on twice with this project. It’s a sign that I’m getting better at judging the length needed for a long tail cast on. True, the second time I had quite a bit of extra tail, but that’s not the most important thing. Actually, the most important thing is that I cast on five hundred and forty something stitches by my lonesome twice. Well, almost twice. The first time I ran out of tail about thirty stitches from the end. On a very interesting front, look what my drumcarder-owning friend found while traveling. 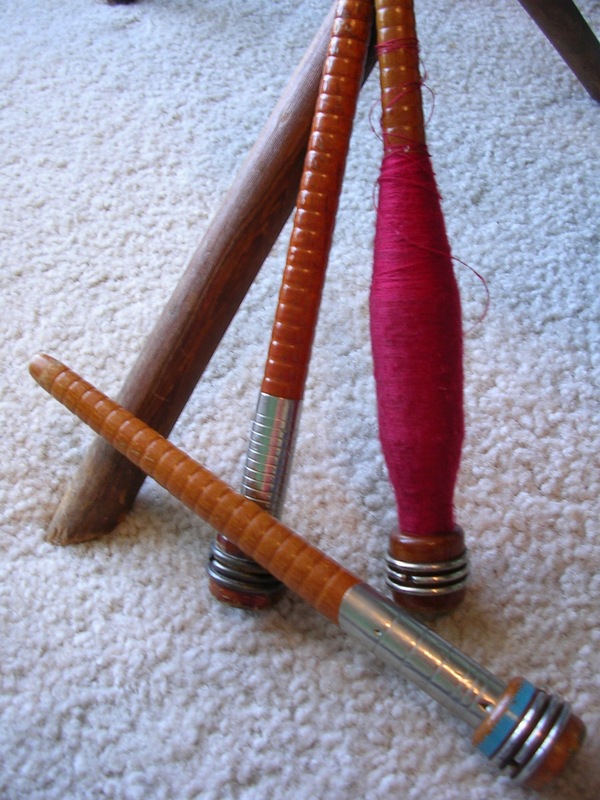 These, believe it or not, are three apparently Walking Wheel bobbins. (They’re leaning up against the leg of the Walking Wheel at the moment.) They slide onto the metal prong that I’ve been using as my “bobbin” since I got the wheel. 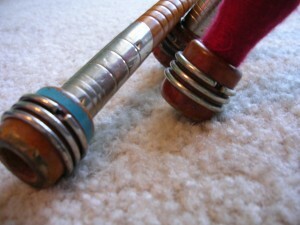 If these actually work, it means I won’t have to stand there and reel off a whole prong’s worth in order to spin more. I’m really liking this! But, of course, the Walking Wheel happens to be full of Willow sock yarn singles at the moment, so I can’t try it out yet. Bother. Did you notice the red thread on one of those? 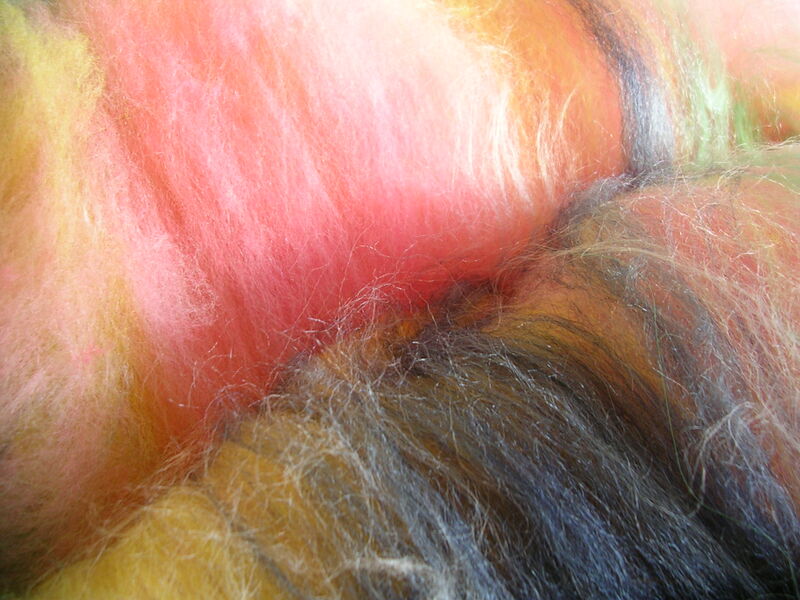 That stuff is hand spun two ply! Thread thin! Consistent as all get-out. Good night, I don’t know if I’d be able to spin like that on a Walking Wheel without years and years and years of practice. Wow. Oh, I promised another batt picture. Here is a close up on my “Night in New Orleans” batts. Very bright and cheery. 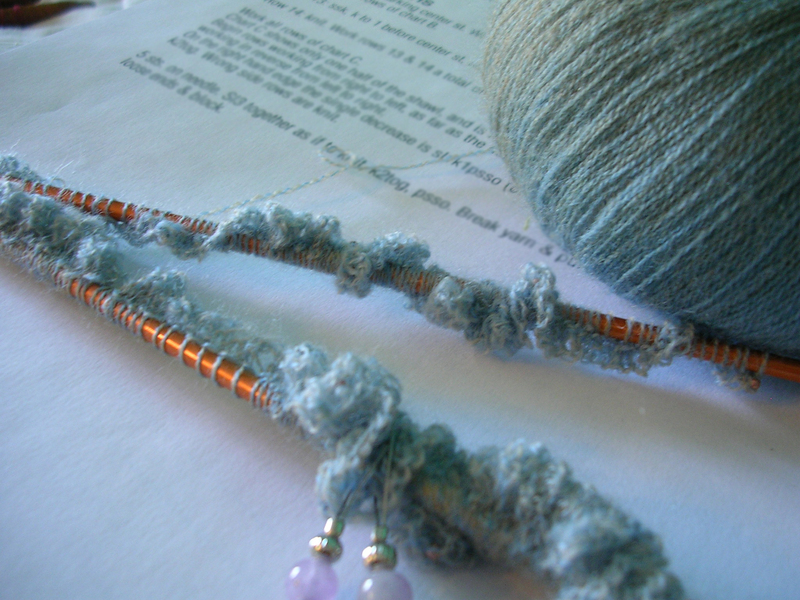 Actually, a lot of knitting patterns call for the beads to be threaded on in advance also. And yes, it’s very tedious. If you are casting on with the long-tail cast on, I just read recently that it takes about 1/2 inch for each stitch. Ooh, rules of thumb are good. Was that for a specific weight of yarn? The other way to estimate for long-tail cast on, is to wrap the yarn around the needle 10 times and then measure how long that is. Once you know that that length = 10 stitches, then you can figure out how much you need for however many stitches you have to cast on!